I didn’t have acne or skin issues when I was a teen. I didn’t have skin issues during pregnancy either. So, the last few months of looking at myself in the mirror have been a tough visual pill to swallow at 44 years old. I’m sure it’s my hormones causing my perimenopause skin issues. Having breakouts like pimples or widespread acne is common in young adults. 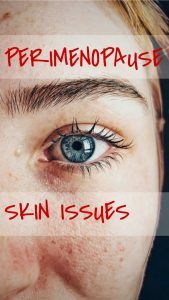 However, one of the signs that your hormones are out of balance is that once clear skin suddenly seems to revert to a teenager’s worst nightmare. But that’s not the only issue that unbalanced hormones can cause for your skin! Changing levels can make a skin that was once smooth and firm begin to develop wrinkles. Most people don’t realize that these changes aren’t always related to aging. The development of wrinkles, especially if it’s sudden, is a warning sign that you need to get your hormone levels checked. Not only can unbalanced hormones cause wrinkles, but they can cause fine lines to appear, too. These fine lines can appear in the normal area where this develops – such as around the eyes as crows’ feet or around the mouth, but you’ll often notice it on other areas of your body as well. When your hormones aren’t at the levels that they’re supposed to be at, your skin will begin to lose its moisture as well as its elasticity – so as a result, you can end up noticing that your skin is dry. You may also notice areas where the skin sags. Redness or the appearance of flushing anywhere on the body – but particularly the face – is another warning sign that your hormones aren’t doing what they’re supposed to be doing. I honestly thought that the issues with my skin have been because I don’t drink enough water (or anything for that matter). But, the more symptoms that have built up, the more I realize this is probably peri-menopause. Even as you go through the different stages in life, your hormones, if they’re at the level they need to be at, won’t show up as changes in the skin. So don’t automatically dismiss skin changes as part of getting older or as a life stage such as perimenopause or menopause. Menopause is a change, but that doesn’t mean that your hormones are destined to be off balance. Even during menopause, your hormones shouldn’t give you any severe symptoms and they shouldn’t wreak havoc on your skin. Keep in mind that many different hormones can impact your skin. That’s why you need to be careful attributing skin changes to any one particular hormone. It’s always best to know what’s going on. When you know which hormones are out of whack, you can then take action to restore the levels to their normal state. When you do that, your skin will return to the same condition it was in before the hormone levels went wrong. I’ve used a bullet journal for the last year and a half. Part of it has contained a period tracker for myself and my daughter. 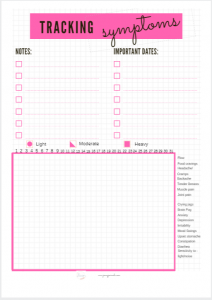 But, some of you don’t use a bullet journal, so I created a printable version with a grid to track your symptoms related to hormones or peri-menopause, including an area for notes. This article is part of a weekly series on Perimenopause. Want notification of new articles in the series as they are posted along with a printable to track your possible symptoms? To receive the free printable, please subscribe to our newsletter with this form. Don’t worry, you can unsubscribe at any time! Next Post Why Do You Need to Create New Habits? Could Journaling Help Me with My Anxiety? Why Do You Need to Create New Habits?